Clicker Training and Marker Training are the best tools available! Clicker training has been mislabeled as a “new” training concept among society, and still, even though there has been proven results for decades, there are unfortunately many dog trainers and other experts who claim that this training concept doesn’t work. Clicker training is not something new on the scene. It was first used and successfully applied by Keller and Marian Breland back in the early 1940s only they were calling the clickers “crickets” back then. Since 1943 the Breland couple (later joined by another great expert Bob Bailey) opened the “Animal Behavior Enterprise” where they have successfully trained over 150 different species, and 15,000 animals. Today, all of the dog training concepts that we do (and animal training, in general) can be contributed in one or another way to these great pioneers and experts. Acknowledge that you are having an issue. This is the first step. You need to recognize and admit that you are facing the issue and that something has to be done. This normally leads automatically to the next level. Facing the fact that you are dealing with an animal. As much as dogs are part of our families, they are still animals and no matter what language we use, or how good or bad our gestures or body language is, the fact is that animals don’t understand us unless we first do some type of training in which we can “explain” to our dogs what and how to do certain things in certain situations. This automatically leads to the third level. You will always end up at this spot. You can’t avoid learning about dogs, and their behavior and training concepts. No one can train your dog for you. Even if you purchase the most, well-trained dog in the world, if you don’t continue to work with him that dog will end up forgetting those learned skills. The next thing that you will find as an obstacle is what type of training to use? Libraries, internet, book stores are all swamped with different training concepts. However, there is one that is scientifically proven and is considered to be by far the best method to use if you learn how to do it properly; that is the clicker dog training concept. What is a clicker and what is clicker training? 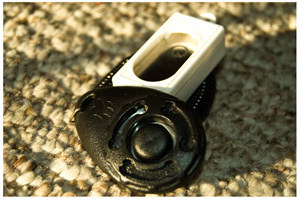 Many dog owners decide that they don’t need the clicker simply because they will deliver the treat anyway, for example. This is wrong. It is scientifically proven that in order for an animal to connect their behavior with the reward, you need to deliver that reward within 0.8 of a second.No matter how fast you are, that is impossible in most cases. On top of that, as soon as you move to take to get the reward for your dog (or to give him the reward) your dog will most likely refocus on you, which will delay or even completely jeopardize the training, because now he is being rewarded for focusing on you and not for the original behavior that you were intending to reward. Even the famous Dr. Pavlov encountered the same problem when he worked on classical conditioning research back in the days. In the beginning he used assistants to deliver the food to the dogs, but the dogs were so distracted that they were unable to achieve the goal; therefore Dr. Pavlov had to replace the assistants with automatic feeders. It is the clicker (or marker) that allows us to “mark” a specific behavior with our dog, and for our dog to take a “snapshot” of what he is doing in that moment. Once the sound of the clicker is emitted, the dog is allowed to break the position and access the reward (or the reward is delivered to him while still performing) but there it is a straight-forward message to the animal of what he is getting rewarded for. Clicker training (marker training) is a complex science. Although only the tip of the iceberg, in order to gain the benefits of this type of training, you need to know; why some things work and why others don’t, what is considered to be a reward and how to use it properly, and how to arrange the environment and deal with distractions. There are many aspects to successful dog training, and clicker training is no exception. This section is about the benefits and limitations of clicker training, you can find the differences between the use of a clicker and a marker. What is the most common way to misuse the clicker? Find out how to practice and improve your timing with the clicker here. 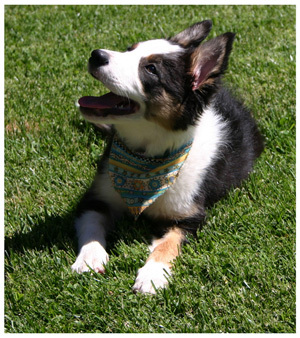 Learn more about the rewards system in dog training. See what type of rewards we can use and what type of food rewards we commonly use in clicker training. Learn how to properly hold the treat in order to avoid getting nipped or in order to better position your dog (luring training concepts). Here you can find out about how to position your treat in order to improve the dog’s learning speed and accuracy. For more details please Click here. This is the official first step in clicker training. 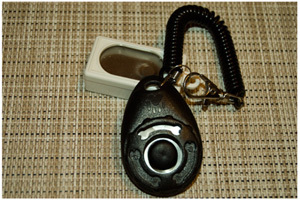 Learn how to prepare your dog for clicker training. Learn how to address mouthing and nipping at your hands while holding a treat. Find out how to explain to your dog what the clicker is. 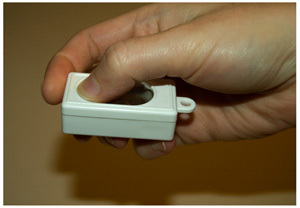 Desensitizing and counter conditioning for noise (or clicker) sensitive dogs. For more details please Click here. One of the biggest problems for most dog owners is the rate of reinforcement. Clicker training wouldn’t be so successful if we missed out on this very important concept. It is important to know what a high-reinforcement level is, what continuous reinforcement is and variable and random reinforcement. You can find out more about reinforcements Here. There are cues that are used in dog training. In addition to the most common ones there are also additional cues such as “good” and “wrong” or “no”. These are some very valuable tools in your training toolbox that can be used to increase your communication ability your dog. Learn why we use these commands in dog training and how to properly train them for our dogs. For more details Click Here. Most dog owners and even some dog trainers don’t know or don’t understand the meaning of “criteria” in dog training. This is an essential part of clicker training. It is a map/plan of your training. Sure many of you may think; “well I don’t need a plan I just want to train my dog to sit...” Well that would be the wrong approach. Unfortunately, most dog owners don’t succeed in training their dogs even the simplest of tasks like “sit”. What they end up with instead, is an unreliable command that their dog performs every now and then and to which their dogs almost always break the position on their own. Learn how to properly introduce different criteria in your training. Understanding criteria will open you to completely new horizons in dog training. Just like in clicker training, “criteria” is something that you will face in your everyday life. This is a part that you can’t avoid. For more details Click Here. This is the beginning of the actual dog training. Here you can learn about the differences between shaping, luring, and targeting. When and how to use those techniques, as well as how to start training behaviors (from simple ones like sit, to more complicated ones), when to put the behavior on cue (when to name it) and why it is done this way, etc. You can find out about these details and more Here. Here you can find more details about generalization, distractions, and working in new environments. What is the idea of “going back to kindergarten” clicker dog training, how to create behavior chains, and what backchaining is, etc. What is repertoire reinforcement, repertoire cuing, etc? Learn how to start fading out the clicker. For more details Click here. Although there are many more steps in Clicker training, keeping it simple and understandable is the main goal of this website, so that the information within can help with training your dog and you. I apologize to my colleagues and fellow dog experts if some of the descriptions are too simplified or basic, but I want everyone to be able to understand and benefit from this training concept, regardless of their familiarity level with the science of it. No matter if you planned on becoming a dog trainer or not, by having a dog with you and in your home, you don’t have a choice. It is up to you how much you will learn and invest in order to make the magic of a good relationship happen with your dog.